I don’t know about you, but ten black liners per person, is a bit much. I do know how it happened, but if I don’t say it out loud or write it on this blog; I can stay in sweet ignorance. This doesn’t even include the more popular Mac’s Blacktrack and Bobbi Brown’s black gel liners. I figured since I’ve accumulated so many, I’d do a side-by-side comparison to compare the pigmentation. The pictures were taken on top of Urban Decay’s Primer Potion in the color Eden (NC45 for reference). Outside of pictures for this blog, I typically don’t line my upper or lower waterline in black; especially the lower. My eyes are too small. I like the look of black liner along my upper waterline, but I’ve been challenged at finding a liner that doesn’t bleed onto the lower. Some are better than others. I haven’t found one that doesn’t give me mild irritation. QUICK TIP: Dab your water line dry first before applying liner. It will help it last longer. Not my favorite liner. I don’t remember having problems with this liner smudging, but I hardly used it. I found the brush made way too thick of a line and I’m not skilled enough to make it work. In fact, I tossed it after taking photos for this post – it was time. This liner has been discontinued. This is my new favorite liner. The felt tip makes it a breeze to use, forms a wing with ease and is nice and dark. When this liner goes on, it doesn’t move. This liner wins the prize as ‘The Blackest of Them All’. The best thing about this product is that it’s only $12 and you get 5.5 grams of product. This is why I chose INGLOT over Bobbi Brown and MAC’s black gel liner. When used on the upper waterline, I noticed slight transfer to the bottom waterline at the corners under twenty minutes; nothing more thereafter. I’ll admit I bought this liner specifically for this post. The post lacked a cheaper, more readily available alternative. In fact, it is a fantastic liner that can be purchased at a drug store for around $6.50. It is tied for third place for ‘The Blackest of Them All’. One downside is the top wears down really quick. I felt the need to sharpen it after each use. It lasted over two hours on my lower waterline. This liner comes out every now and again during Mac limited edition collections. It generated huge buzz during the holidays last year and I got sucked it. This liner, though very black, was a letdown. It is the only liner that smudges on my upper lash line. It is tied for third place in terms of pigmentation. 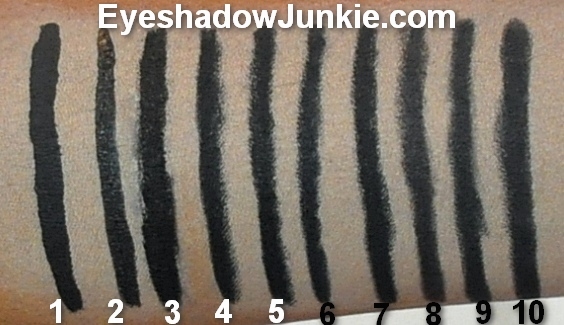 If you’re looking for a very black liner specifically to smudge, this does it smoothly. I owned this liner long before I had a makeup collection. It hasn’t gotten much love from me in quite some time. Since it is a kohl pencil, it tends to smudge, but not as bad as Feline. This pencil came out with Urban Decay’s 15th Anniversary collection. It will be released again soon for Urban Decay’s holiday collection. I don’t use it much because I want to make it last as long as possible until Urban Decay has enough sense to make it part of its permanent range. It is very black, smooth and easy to use. It is runner-up for ‘The Blackest of Them All’. It doesn’t smudge or fade on my upper lash line. UPDATE 1/14/12: This liner has been made permanent to Urban Decay’s line. This had been my go to liner for a long while. I owned so many of them. Urban Decay has a bad habit of including a Zero in all of their holiday sets. It’s surprisingly the palest of the group. I’ve never had any smudging or fading issues. This is a twist up liner. It wasn’t the smoothest of the liners. It tugged a bit when swatching. I have no problems with transferring or smudging. The container doesn’t come with a sharpener so pencil will always have a blunt end. This has been my latest go-to liner. It is smooth without being too soft. No smudging or fading.